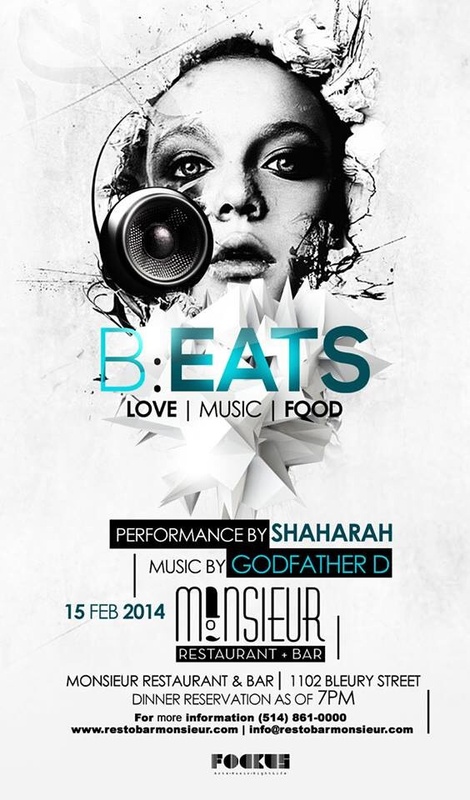 Saturday February 15th 2014 marks the beginning of a new urban movement in Montreal… B : E A T S ~ Love Music Food. An experience that will be held monthly in the charming restaurant and bar, MONSiEUR, located in Montreal’s Old Port, right in the middle of the financial district that will combine art, music and food. 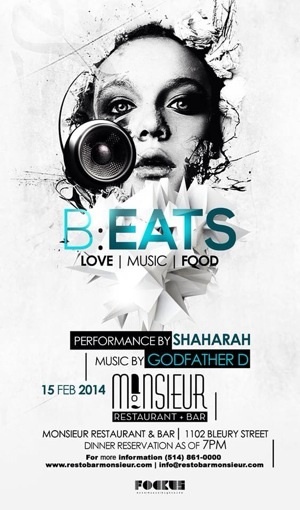 For our first installment, Shaharah accompanied by Paul Lizzi & Ralph Telemaque will provide the live entertainment while you discover MONSiEUR’s gourmet menu. Following dinner, Godfather D aka Don Barbarino will serve up the musical goodness that will surely have you dancing until the wee hours of the morning. Hello! Please reserve 2 dinner places for me.